Home » Atlantis 2109 SOLD! Atlantis 2109 is a comfortable and cozy two bedroom, two bath condominium offering spectacular views of Brigantine Bay and steps away from your own private finger dock and boat slip. Within the prestigious residential resort of Treasure Cay, this well maintained 1,000 square feet of waterfront casual living retreat is fully furnished and turn key ready. 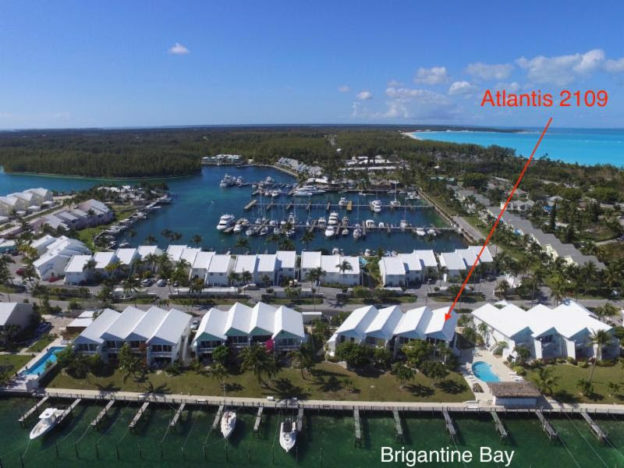 The popular Atlantis condominium complex is a short walk to the world famous 3 and 1/2 mile powdery white sand beaches of Treasure Cay. Crystal blue waters are the background for outdoor dining and a variety of water sports are available. Across the street the village of Treasure Cay offers shopping, dining, a full service marina, bank, library, church and medical center. An 18 hole championship golf course and newly renovated tennis center are also located within Treasure Cay. From sunup to sundown, activities in this paradise are plentiful! Atlantis 2109 offers a wonderful opportunity for a family vacation getaway, a full time residence or an income producing rental property!